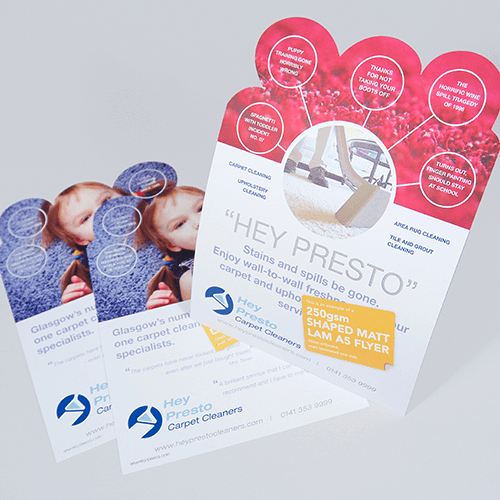 Flyer printing is what we’ve done best for over 20 years. With a huge amount of options like flyer sizes and papers, you will always create the best possible invitations, price lists or menus. If you’re looking for something a bit thicker than a leaflet, maybe for a hand-out or to give your message more weight, try printed flyers. Add a cut-out shape of your choice to make your flyer really unique. Whatever the use, we have a flyer to suit your business. Click on our flyer products on the left to find out more about them. That's the flyers arrived - they look great, thank you very much for another great and speedy job!